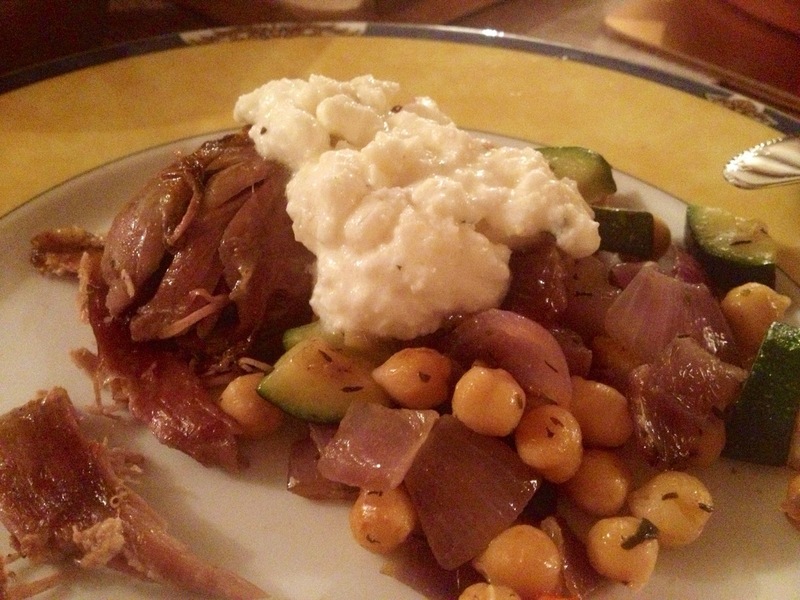 A few months ago I was watching Andy Bates’ Street Feasts on Food Network and saw him make this delicious lamb recipe and have been dying to give it a go ever since. A few weeks ago I finally got around to giving this one a go and did it for the whole family on a Saturday evening. I already had a leg of lamb, so adapted the recipe slightly by using this instead of the shoulder joint used by Andy. The lamb joint is marinated overnight with cumin and garlic and roasted slowly in the oven so that the meat starts to fall off the bone. I didn’t have time to do this the day before and I marinated a little while before I put the lamb on to cook. The flavour of the cumin used in the marinade didn’t come out in the lamb too strongly in the end result so I think marinating it overnight as per the recipe would have helped this. 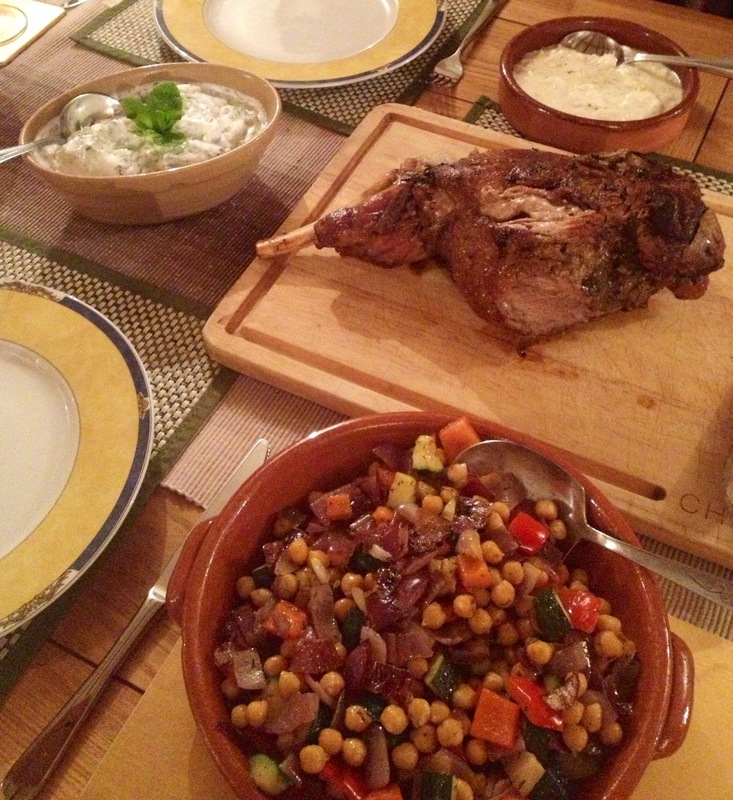 Accompanying the meat is a sautéed chickpea and vegetable side dish, Greek tzatziki dip and a feta cheese dressing. All the side dishes are really quick and easy to prepare whilst the lamb is in the oven so making this really wasn’t complicated at all. I loved the chickpeas and vegetables as a side dish and will definitely make this again to go with other meals. The highlight of this meal was definitely the feta dressing though. I often use feta in salads and Greek spinach and feta pies are one of my specialties, but I’ve never thought of heating and melting it into a sort of sauce like this before. This cheesy, garlicky sauce would make a great dip, and worked amazingly as a dressing with this meal. The lamb cooking slowly made it really juicy and not overcooked and dry at all, although I think the lamb shoulder joint from the original recipe would probably have worked better and cooked more evenly. I also bought tomato and basil pita breads to have on the side with this dish so we could make up filled pitas, and they were delicious! 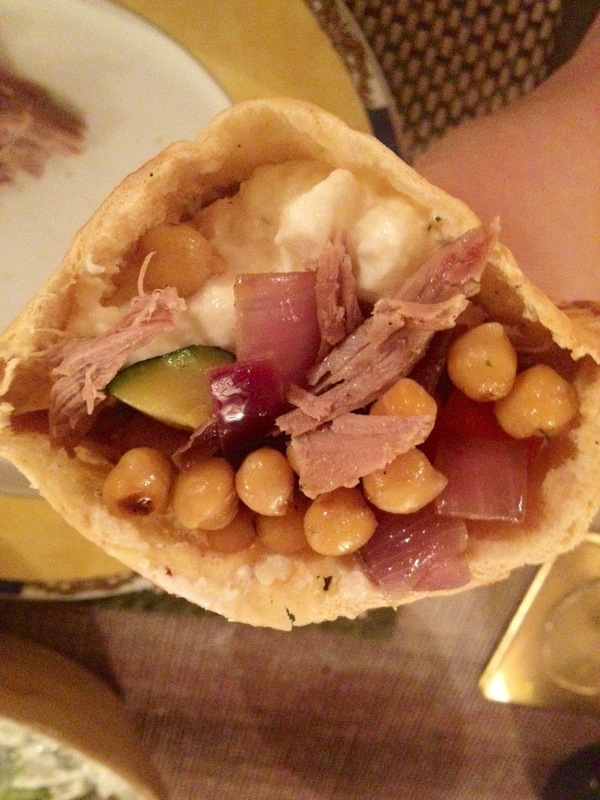 If you make enough to have plenty of leftovers these pitas would also make a great lunch. I used the leftover vegetables and tzatziki in the wraps I made for my packed lunch the next day. This was a great meal and I’ll definitely be adding it to my repertoire and making it again. With no stodgy potatoes or rice on the side it’s really light and quite healthy but still really filling and more than satisfying. This would be a great meal to have in the summer time and is a great one to share with friends and do for dinner parties. You can find the recipe on the Food Network website if you fancy giving it a go yourself.